Devil's Moon by Matthew Marine, a Mysterious Review. Review: Phoenix-based FBI Agent Stuart Ransom assigns himself the case of a murder/suicide in Sedona, one the local police have all but closed themselves. And yet Ransom suspects there may be more to the crime than what's written in the official report in Devil's Moon, the possible first in a series by Matthew Marine. Amanda Pearce's headless and brutally beaten body has been found in the basement of her killer, police officer Craig Adams, whose own body, a bullet hole through the head, is found nearby. Amanda's head is found placed on a side table, surrounded by photographs of the abuse she suffered while still alive. Sedona's chief of police calls the case a simple murder/suicide, open and shut. Ransom isn't so sure. The crime scene itself was contaminated by the first officer on the scene, and there are a few other inconsistencies that bother him, not the least of which is that Adams was a model officer. Ransom doesn't want to contradict the official finding of the local authorities without good reason, but he thinks that the chief's personal connection to the victim may possibly be clouding his judgment. Still, he's one to talk: he has a daughter about the same age as the victim, and wonders if he would be so objective if it were her body in that basement. Stuart Ransom makes an astute observation early on in the case, one that all but directly identifies the killer for the reader, but one which Ransom himself doesn't immediately follow through on, a slightly out-of-character lapse for an FBI agent who is otherwise quite thorough. 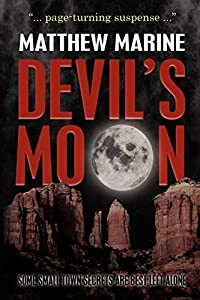 That relatively minor plot convenience quibble aside, Devil's Moon is a nicely structured, evenly paced police procedural, one that takes advantage of the changing nature of a once isolated, but now much less so, Arizona city. Misdirection is credibly handled, with a handful of subplots that relate directly to the primary storyline. The crimes scenes may be a little overly graphic — not quite so much detail is really needed to convey how horrific they are — but that, too, is a minor criticism. Acknowledgment: Open Books Press provided an ARC of Devil's Moon for this review.